Whitetail Deer (Odocoileus virginianus) are the most common large North American land mammal, and one of the most popular animals to hunt in the world. With their muscular bodies, timid personality, acute hearing, and their keen sense of smell, whitetails are remarkable creatures. When a whitetail deer is startled, it will raise its tail to expose the white underside. This signal serves as a warning for other deer, and this instinct gives the whitetail deer its name. Whitetail deer are the smallest members of the North American deer family. Male whitetails, or "bucks," range from 100 to 300 pounds, while females, or "does," range from 75 to 200 pounds. The average height of a full grown male whitetail is approximately 6 to 7 foot. The largest whitetails occur in temperate regions of the United States and Canada. Few whitetail deer live more than 5 years in the wild. Some whitetails have been found to be up to 11 years old in the wild, and domesticated deer have lived up to 20 years. Whitetail deer are pretty fast. A whitetail deer can run at speeds of up to 40 miles per hour, and swim at speeds of up to 13 miles per hour. Whitetail deer have a very long stride when running, up to 25 feet. Whitetail deer have an extremely diverse diet, and have been known to eat over 600 different plants. They love to eat acorns, grasses, leaves, crops like soybeans and corn, berries, twigs, fungi, fruit, and nuts. Whitetail deer have a four chambered stomach, which allows them to digest extremely tough vegetation. They will eat quickly without chewing while feeding, and later they will cough their food up and chew it. 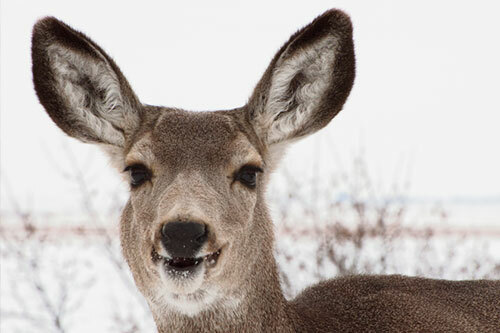 Whitetail deer have highly specialized teeth to help them with their diet. Whitetails have sharp incisors for biting through tough vegetation, and big molars for grinding it up when they chew. The whitetail's coat will change with the seasons, from reddish brown in the spring and summer when vegetation is growing to grayish brown in the winter. This helps the deer to stay camouflaged all year round. The change in color happens quickly, usually in 1 or 2 weeks. Whitetail bucks will shed their antlers in the winter, like most other species of deer. If a whitetail buck is diseased, they may drop their antlers in the spring or summer. During the spring whitetail bucks will grow antlers at a very rapid rate. Some sub-species of whitetail deer will grow antlers at a rate of 1 inch per day. During the spring and summer whitetail deer antlers are covered with a highly vascularized tissue called velvet. This velvet will dry out, and the antlers will harden in the fall. Hardening of the antlers happens due to calcification, which occurs when testosterone levels in bucks rise during the fall right before and during mating season. Whitetail bucks will use their antlers to fight with each other during the "rut" when they are competing for does. The sound of antlers clashing can attract does who are in heat. Some whitetail bucks, known as "spiked" bucks, will never grow antlers much bigger than 3 inches. In rare cases, female whitetail deer can grow antlers due to abnormally high levels of testosterone. Shed whitetail deer antlers are rarely found in nature, they are often eaten by rodents and other small animals because they are rick in calcium and other nutrients. 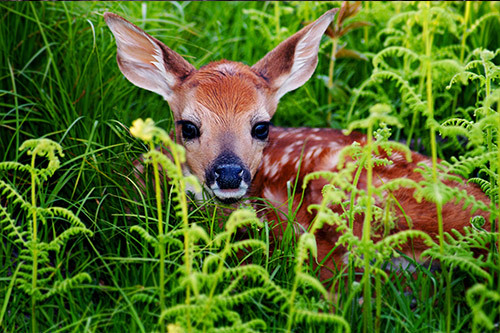 Whitetail deer fawns are normally born sometime between late April and early May. 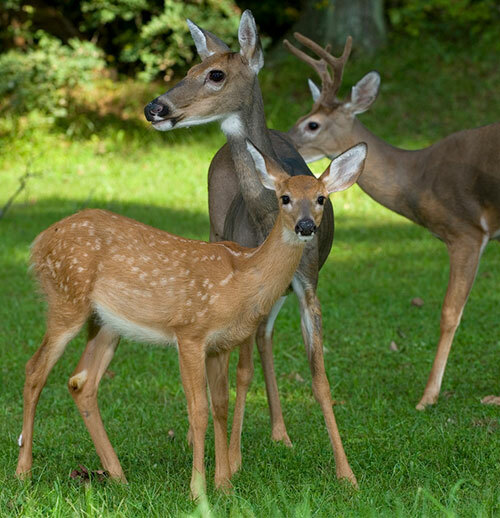 Whitetail deer are the state animal of 9 states: Arkansas, Illinois, Michigan, Mississippi, New Hampshire, Ohio, Pennsylvania, South Carolina, and Wisconsin. Because a deer’s eyes contain more rods than cones, they have sharp night vision, but not very good vision in daylight. The colors green, orange, and red appear to a deer as shades of gray, which explains why hunters are able to wear bright orange safety clothing. Whitetail deer are found in the majority of North America and parts of Central and South America. Some whitetail deer can even be found in Europe. They are generalists, which means they can adapt to a wide variety of habitats. Once a whitetail deer has found a place with enough food, it tends to stay close by; they have relatively small home ranges of about one square mile or less. The most common place a deer will live is in a wooded area. What Do Whitetail Deer Eat? The whitetail deer is a herbivore, and grazes on most obtainable plant foods. With their diverse diet, they have been known to eat over 600 different plants. They love to eat acorns, grasses, leaves, crops like soybeans and corn, berries, twigs, fungi, fruit, nuts, legumes, bark, and clover. Whitetail deer can eat many mushrooms which are poisonous to humans. Foraging times mainly occur at dawn and dusk. This is the time they move about the most, making them neither nocturnal nor diurnal, but crepuscular. They also have highly specialized teeth to help them with their diet. Whitetails have sharp incisors for biting through tough vegetation, and big molars for grinding it up when they chew. Whitetail are most active during the dawn and at dusk, when they feed. 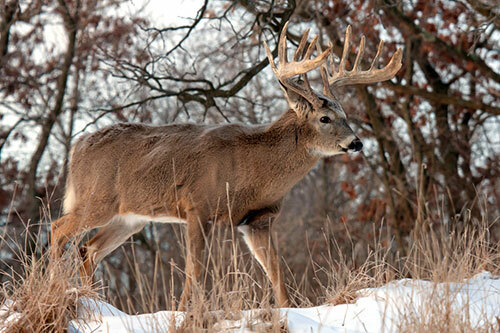 When temperatures drop to single digits Fahrenheit, whitetail deer will be active during the midday hours. Feeding habits of whitetail deer change seasonally, during the spring and summer they will graze in meadows where food is abundant, and during the winter they will move into forests to eat bark and twigs and seek protection from the elements. Whitetail deer like to bed down near sources of water such as streams, lakes, marshes, and swamps. Whitetail are extremely wary of the scent of humans. They have been known to detect the scent of humans on underbrush for days after leaving the woods, and will be extra cautious for weeks afterward. It is always important to wear camouflage patterned clothing with a bright orange safety hat or vest when in the woods. Fellow explorers will be able to easily spot you, but the deer will have a much more difficult time. Check your state’s feeding and baiting laws to learn if it is legal to provide the whitetail deer a food source or mineral and salt block. Deer drop their racks from mid-winter in the North through mid-spring in the South. Because squirrels and chipmunks will chew up the antlers, make sure that you search for them right around the time that they usually fall in your state. There is nothing worse than finding a nice antler all chewed up.